A New Ultima For A New Age, With New Problems. Ultima IV: Quest of the Avatar was a revolutionary role-playing game from a legendary game designer. Ultima Forever: Quest for the Avatar updates the classic with shiny new graphics and modern free-to-play social features that might be more trouble than they are worth. Ultima IV was a revelation. After three games spent sending players on quests to overcome the ultimate evil of the week, designer Richard "Lord British" Garriott took the series in a refreshing new direction. With evil abolished, the people of the newly-renamed land of Britainnia needed direction, an example to follow. The in-game Lord British declared a quest to find the Avatar — a person who best embodied the eight Virtues of Honesty, Compassion, Valor, Justice, Sacrifice, Honor, Spirituality, and Humility. Rather than overcoming some great evil, the Ultima IV player was tasked with becoming a better person. The Virtues concept carried over into subsequent titles, but this is where it all began,, and it was brilliant. Developed by EA's Mythic, Ultima Forever: Quest for the Avatar is an updated version of that original game. Lord British has been replaced with Lady British (Richard Garriott took his name with him when he left) There's an overarching plot — the Black Weep is spreading across the world, corrupting its inhabitants. Only a hero that embodies the Virtues can hope to overcome it. Is it you? It's definitely not this guy. Quest for the Avatar is part single-player action role-playing game and part MMO. As you wander about the isometric lands of Britainnia, other players wander about on their own quest to embody the eight virtues. Some do a better job than others. You can play with these people, forming groups and taking on the dungeons that dot the map. You can generally find folks standing around outside quest-mandated adventure areas, waiting to see if anyone else shows up. Sometimes they'll invite you to group, and that's fun. In my experience, many of these players would prefer to go it alone. That's just fine with me. I like to follow my own path, giving my own answers to the ethical quandries presented as I travel the world, even if they might lock me out of a quest chain. It's not just about accruing Virtues — you have to understand that following them has consequences. You may have picked the pendant off a corpse to return to its family out of Compassion, but when they discover you disturbed the body, suddenly they don't want to talk to you anymore. Moments like those are scattered sparsely throughout a game that's mostly structured as "gather quests, defeat dungeon, turn-in quests." When they do crop up, that's when I feel the strongest connection to the original game. Between those perfect moments, I've mostly been moving from dungeon to dungeon, tapping away at evil. 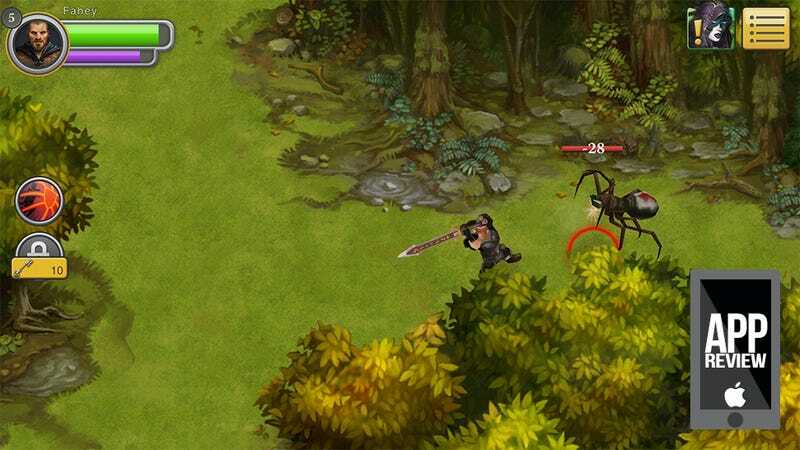 Ultima Forever is a simple tap-to-attack dungeon crawler most of the time. You can flank enemies and backstab, but for the most part you're tapping to initiate combat or activate whichever special ability you've assigned to the single unlocked slot. Here's me running through one of the game's dungeons, tiny adventures listed on the map with recommended player levels and time required (this was a 15 minute run). It's a solid chunk of fun, at least until your initial allotment of golden keys runs out. Then free-to-play starts poking its nose into your wallet. Enemies drop bronze keys. These are used for fast travel, or to unlock chests offering the most basic loot. Those bronze keys can be combined into silver keys. Silver keys offer a better chance at rare treasure, and are also required to repair armor and weapons, which deteriorate while you play. Golden keys give players access to the best loot. We're talking so good you'll feel embarrassed for silver and bronze loot. Rare and epic loot which, even when completely broken, gives better stats and does better damage than brand new uncommon and common stuff. Golden keys unlock new equipment slots. Golden keys can be used to unlock a second skill slot. Golden keys will heal you when you've run out of potions. Golden keys are life in Ultima Forever. It's a bit ridiculous, especially when all of your equipment is broken and you're out of both golden and silver keys. The only option is to wander lower-level dungeons, gathering enough bronze keys to transmute to silver for repair. There is no other currency in the game — you can't just pay gold. There's a definite pay-to-win feel to Ultima Forever: Quest for the Avatar. You'll get further into this expansive fantasy world much faster if you invest heavily. It wouldn't be a big issue if the reminders weren't so prominent — every time you open a chest; every time you open your inventory to see the condition of your equipment. But somewhere beneath the pile of golden keys you shouldn't buy, there's a quite good homage to a role-playing classic, waiting for you to rise to the challenge. You can enjoy Ultima Forever: Quest for the Avatar without paying for it. It just takes a little patience, and hey — patience is a virtue.